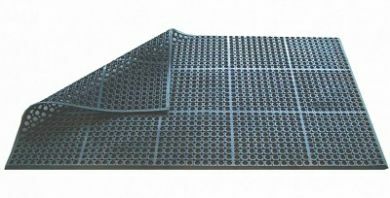 The Rubber Anti Fatigue Mat is perfect for use in busy commercial kitchens and bars, with a 15% nitrile construction for extra grease resistance. Anti fatigue matting offers joint relief for staff, helping to keep ankles, knees, hips and backs comfortable when standing for long periods. Featuring drainage holes to ensure liquids can safely drain away. Ideal for floor areas behind bars and in commercial kitchens, it will help reduce glassware breakages ensuring your staff stay safe. 150cm x 90cm x 1.2cm.